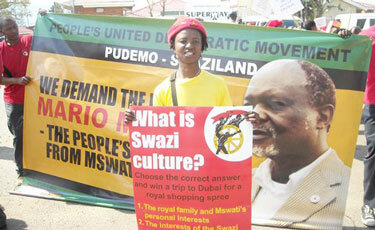 Right to unionise under threat in Swaziland – act now! ACTSA, UNISON, PCS and Prospect are joining forces to speak out against a new law to be introduced in Swaziland. The Public Services Bill will make it illegal for public officers to take part in political formations or groups. The definition of those groups has, however, been left vague. The UK places restrictions on senior civil servants, in order to maintain the impartiality of high-level public officers. The Public Services Bill in Swaziland is not so equitably targeted. Due to the loose definition of political formations, this will preclude public servants unionising.